The Republican Hindu Coalition (RHC) is launching a $400,000 digital ad buy 24-hours before Election Day to target independent voters in battleground states. The 30-second ad will run in the swing states of Ohio, North Carolina, Florida, New Hampshire, Michigan, and Colorado, the group says in a news release. After the tremendous success RHC has seen in this campaign through our television, radio, direct mail, and mobilization efforts in the Indian community, we decided to expand our efforts to target every last independent voter we can reach in the final 48 hour stretch. 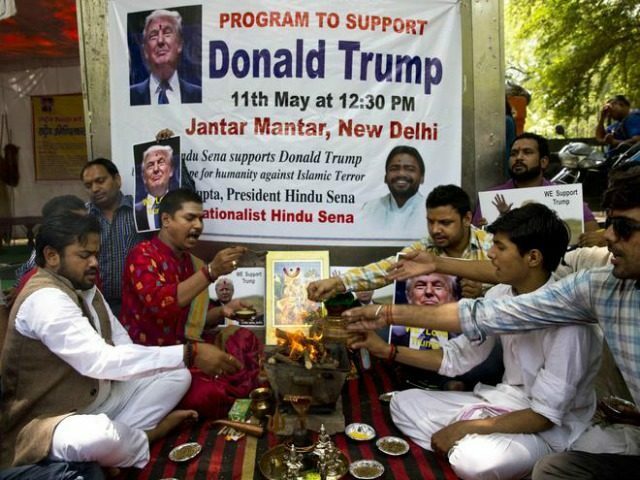 The fact that the Republican Hindu Coalition, an immigrant group representing 4.2 million non-white Hindu Americans, is absolutely committed to the electing Donald Trump as President, illustrates the diversity of the Trump coalition, and belies any who say that Trump is a racist with narrow appeal to white Americans. We expect these digital ads, which were designed for maximum impact on undecided and independent voters, to be the final boost to push Mr. Trump over the edge in Florida, Ohio, North Carolina, Michigan, New Hampshire, and Colorado. We look forward to celebrating with Mr. Trump on election night, as these states fall into the Republican column. The ad is titled “America’s Bright Future” and emphasizes Donald Trump’s economic policies. It suggests Trump’s polities will support legal immigration and increase jobs, while Hillary Clinton’s policies will increase taxes and the national debt. This is the first ad by from the Republican Hindu Coalition that reaches beyond its Indian and Hindu audience, targeting independent voters, according to the press release.